St. Louis artist David Hutson’s neon “tube bending” casts a cool, buzzing glow in the Park,expressing neon’s power as an artistic medium. Sited on a towering tree, When I Rise, 2018, is a significant text-based artwork using gaseous typography, cascading a quote from The Mad Farmer’s Poems by celebrated American novelist Wendell Berry: “WHEN I RISE UP LET ME RISE UP JOYFUL LIKE A BIRD. WHEN I FALL LET ME FALL WITHOUT REGRET LIKE A LEAF.” Hutson’s work speaks both literally and metaphorically about connection to place, one of Berry’s fundamental concerns, brought to life here through alchemy— a crafted language stuck to a symbol of life itself. Using the power and inspiration of nature, Hutson’s piece becomes a delightful addition to our light-based sculpture collection saturating the outdoor galleries with moments of illumination. ©1971, 2011 by Wendell Berry. Reprinted by permission of Counterpoint Press. 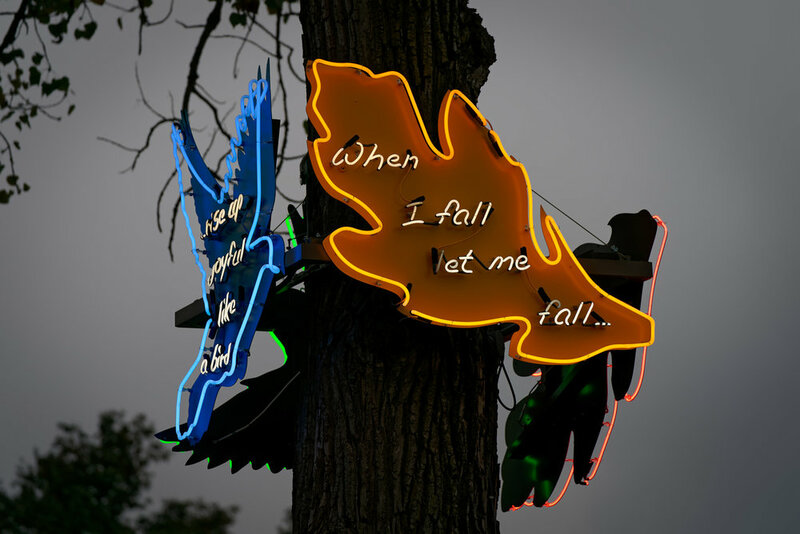 This work was part of the 2018 Kranzberg Exhibition Series: David Hutson, Memory & Desire: A Personal Exploration of Neon Art Past and Present.